A water leak is something that no Fort Worth, TX homeowner wants to deal with. While a small drip may seem harmless, over the course of a month even the smallest leak can add up to gallons of water being lost. But unfortunately, given that the vast majority of your plumbing system is hidden from view, you may not even be aware you have a leak until the problem worsens. Water leaks tend to be very subtle at first, though they can lead to much bigger plumbing problems. Unless an entire pipe ruptures, you probably won’t even notice a water leak. If you know exactly what to look for you might, but the average homeowner does not possess that knowledge. If you want to know for sure whether or not you are experiencing a plumbing leak, then you need to contact ClearWater Plumbers to conduct water leak detection services. Do what you otter… call ClearWater! As mentioned above, water leaks can be extremely difficult to detect without professional services. There are, however, certain warning signs that indicate you should call for those services. For example, have you noticed a spike in your water bills? Your water bill is going to fluctuate on a monthly basis depending on your use. This is natural. However, if you notice an unnatural, sudden increase, you should be alarmed. It’s also important to keep an eye out for a drop in water pressure. There are different reasons this can be occurring, but one of these reasons is a growing leak within your plumbing system. This is a pretty serious symptom and one time you don’t want to ignore the need to fix a leak. One last symptom of a water leak is that your water meter is running despite your turning off all water appliances within your home. If the meter is still running, then water is leaving your plumbing system somewhere, and you have a leak on your hands. Why Are Leaks so Serious? The signs mentioned above are good indicators that you should call a professional to detect if and where a leak is occurring in your Fort Worth, TX home, but this isn’t the end of the problem. The exact location and the cause of the leak need to be determined, or else it won’t be possible to fix it and prevent further damage. If you don’t notice or ignore a leak in your plumbing, you can run into some pretty serious problems down the line. 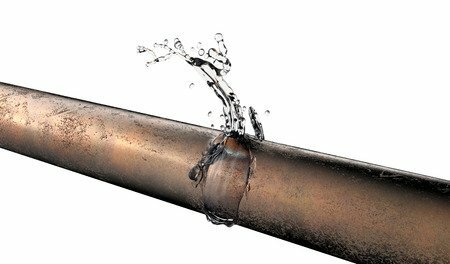 Water leaks rot out the area around the pipes in which they’re occurring. This causes increasing damage that will cost you more and more money to fix as the problem worsens. The average homeowner won’t notice the leak itself when they have one; rather they’ll notice a large moldy spot on a wall or floor that the leak is behind or under. This is why it’s vital that you call our master plumbers for water leak detection services at the first sign of an issue.